GIVING THE GIFT OF SAILING TO ESS KIDS IS ITS OWN AWARD. PLEASE JOIN OUR NOVEMBER SCHOLARSHIP DRIVE by making a donation of ANY AMOUNT. Click to the Sailing School's Rick MacNeil Scholarship Fund – (www.edgewoodsailing.org/donate) – or send a check to Edgewood Sailing School, PO Box 25641, Cranston RI, 02905. This week the ESS family is THANKFUL, as we look back on a record-breaking 2018 season! We are grateful for all of the donors, parents, students, instructors, staff members and friends who made the magic of ESS possible. But even in the off-season, a lot is going on at ESS. At last weekend’s November meeting, the ESS board of directors was busy scheduling and planning for the 2019 SEASON – thinking about new programming opportunities, fleet management, enrollment, and instructor hiring for the year ahead. You can be a part of that 2019 planning now too, by making a donation to our youth scholarship fund and sustaining our capacity to offer instruction to kids demonstrating financial need. 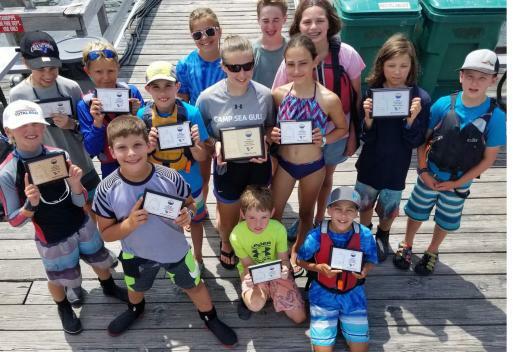 Our scholarship students are some of the most engaged kids we bring out on the water, and we want to make sure we can afford to keep them sailing! ESS is a 501(c)(3) non-profit entity, and your contributions to the scholarship fund are tax-deductible to the extent permitted by law. Your generosity keeps the Edgewood Opportunity open to the next generation of youth sailors.